(CNN) -- Toyota reported a first-ever annual net loss of $4.4 billion on Friday, the latest automobile maker to be battered by the credit crisis. 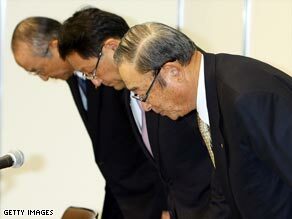 The top executives for Toyota at a press conference in January. The appreciation of the yen against major currencies, rise in raw material costs and the collapse of the auto market in Europe and North America led to the company's annual loss, said Katsuaki Watanabe, Toyota president, at a press conference. "It appears to take some more time before the financial markets in the U.S. and Europe normalize and the global economy recovers," Watanabe said. "However, in the 2010 fiscal year, we plan to accelerate our profit improvement activities including the expansion of our hybrid vehicle line-up such as the next generation Prius in May and the Lexus' HS250h in July." Toyota plans to launch four hybrid models in Japan and three models overseas in the next year. The new Prius model will be more compact and reduce production costs by 30 percent, Watanabe said.